Sorry that these very important notices didn’t make it into the Dunn’s Marsh Neighborhood e-News that went out yesterday. One is about an information session about a HyVee grocery store proposed for the vicinity of Target. The other is a liquor store application for Madison Plaza in the space formerly occupied by Dream Bikes. HyVee is proposing to build a full service grocery store in the Orchard Pointe development across from Super Target. There are many potential challenges, but also some potential benefits that could come from this project if it is approved. The City of Fitchburg has requested that HyVee meet with the surrounding neighborhoods to tell them about the plan, hear their concerns and answer questions. HyVee will be making this neighborhood presentation on Tuesday, November 1st, at 7 pm at Fitchburg Fire Station #2 on King James Way. This is part of the Jamestown Neighborhood Association's monthly meeting. All interested parties are encouraged to attend. There’s a big orange notice on the window of the former Dream Bikes location in Madison Plaza. It informs neighbors that Madison Oil LLC is applying for a liquor license for this location and that the hearing before the Madison Alcohol License Review Committee is Wednesday, Nov. 9, 5:30 p.m. in Room 201 of the City County Building. The owner of the business and person applying for the license is Lakhuir Kaur, an Indian woman. The Madison City Clerk’s office provided this information about the application. Letting our alder Brian Solomon know your thoughts is another avenue. To communicate with Brian, e-mail him at <district10@cityofmadison.com> or <briansolomon@charter.net> You can also write to him at 2148 West Lawn Avenue, Madison, WI 53711. His phone number is 608-446-1362. This e-News is mainly about the October 26 DMNA annual meeting: a greeting from President Bob Hague, a brief agenda, and a notice about how Madison residents might be able to register to vote. This is planned to be a speed meeting of one hour’s duration. Six other short articles complete this issue. The Dunn’s Marsh Neighborhood Association works to make our neighborhood a great place to live! · What concerns do you have about our neighborhood? · Do you have ideas for social gatherings that help us get to know each other? · Are there ways neighbors could help each other during these hard times? During the meeting you will also select your representatives to serve on the Dunn’s Marsh Neighborhood Association Council for the next year (Nov. 2011 – Oct. 2012). We hope to see you on Wednesday, October 26, 6:30 for our important annual meeting! Wednesday October 26th, 6:30 P.M.
You’d have to be an ostrich not to know that Wisconsin has passed the most restrictive Voter ID law in the entire United States. What this means is that it will be much harder to register to vote and even to “get permission” at the polls to vote if you don’t already have a current Wisconsin driver’s license, if you are a student, or have recently moved. “It will be much easier to have one of us register voters ‘off-site’ than it will be to register at the polls,” says Sharon Flinn, Chief Inspector for the City of Madison polls in our neighborhood (HeadStart building). She and her daughter Pam Flinn, also a poll worker, are certified to register Madison residents right where they are - at home, at a store, at the DMNA annual meeting, even on the street. This will save a lot of time for unregistered voters at the polls. Sharon and Pam plan to get certified to register Fitchburg voters as well. This is important since the Dunn’s Marsh Neighborhood straddles the border of Madison and Fitchburg. The Flinns have offered their phone number as a way to get in touch with them if you aren’t registered and want to be. It is 271-3958. The Flinns will be making every effort to come to the annual meeting so that any unregistered voters can fill out registration forms at that time. You will have to show a picture ID such as a Wisconsin driver’s license, a Wisconsin picture ID, a passport, naturalization papers, or a military ID. But the nice thing about registering in the neighborhood rather than at the polls is that you don’t have to prove your current address. That will be handled by the city. The city of Madison will send a notice of registration to the address you give. If it is returned by the post office as undeliverable, it’s assumed that the registrant no longer lives there, and the person won’t be put on the poll list of registered voters. The DMNA will be sponsoring an information session on the new Voter ID law sometime in the future but after the October 26 annual meeting. The annual meeting is set for 6:30 pm at Prairie UU Society, corner of Crawford and Whenona. The “preliminary design phase” for the Verona Road /Beltline Interchange Project will soon begin. 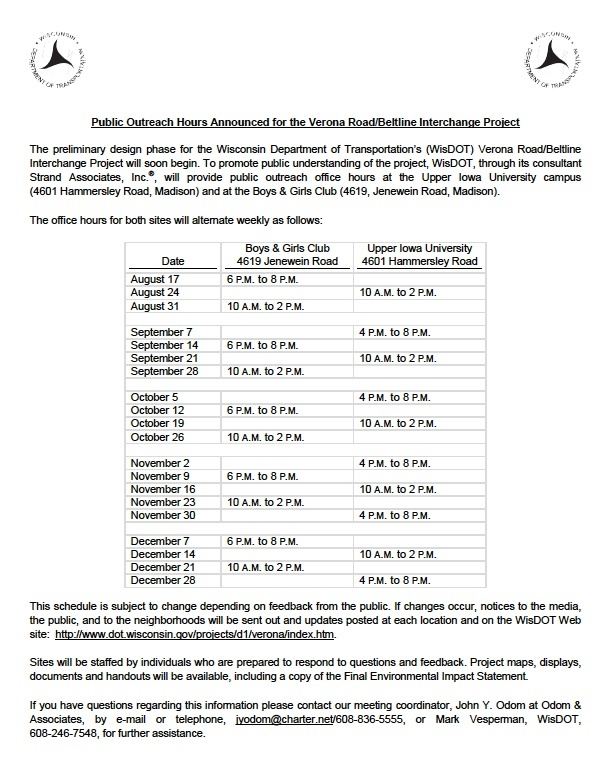 WisDOT through its consultant Strand Associates is providing many public outreach office hours at the Boys and Girls Club and also at the Upper Iowa University campus on Hammersley Road. 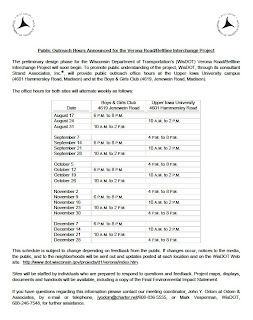 To see the schedule, click on the attachment referenced above. The next two outreach sessions at the Boys and Girls Club are October 26, 10 a.m.-2 p.m., and Nov. 9, 6 p.m.-8 p.m. When I visited, Joe Bunker from Strand and several representatives from Odom & Associates were present including a young woman who could speak Spanish. A video on how to use a roundabout was playing. The reconstructed Verona Road will include a roundabout. I requested a copy of the large map of the project for use in the neighborhood. That map will be provided by Strand and will be displayed at the DMNA annual meeting on October 26. The Verona Road reconstruction project will be seriously underway in 2013. Seeing the project as inevitable, some speakers at the hearing for the Final Environmental Impact Statement spoke about the need for neighborhood people to be employed in the project. How can that happen? One way it can happen is through Construct-U. Construct-U is an 8-week course through the YWCA that introduces women and minorities to the road construction industry and building trades. The class meets Tuesday through Friday from 1:00 to 5:00 pm and on Saturday from 8:00 am until 4:00 pm. What’s even better is that this course is FREE! Ordinarily the course is taught 3 times a year. The next session begins on January 10. One requirement is that potential Construct-U students must attend an orientation session prior to the start of class. Five orientation sessions are being held between November 17 and December 1. All are held at 3101 Latham Drive in the vicinity of Fish Hatchery Road and Greenway Cross, a couple of blocks from Kentucky Fried Chicken. The Thursday, November 17 orientation is at 3 p.m. Others are on different days and at different times. A flyer about the course is available at the public outreach sessions for the Verona Road project that are held at the Boys and Girls Club and Upper Iowa University campus on Hammersley Road. More detailed information is also available from Kevyn Radcliffe, Construct-U Instructor, at 257-1436, option 3 or by e-mail at kradcliffe@ywcamadison.org. This flyer and Construct-U are not going unnoticed. When I stopped into the public outreach session for Verona Road on October 12, several young Black women were inquiring about Construct-U and how it would help them get jobs on the Verona Road project. Walking around in the dark, cold streets to gather candy is hard work! Take a break from trick-or-treating by warming up to some hot apple cider and eating some spooooky treats! The Halloween Party is for anyone in the neighborhood. Stop by at Prairie UU Society between 5:00 and 8:00 pm on Monday, October 31. Location is at corner of Whenona and Crawford. 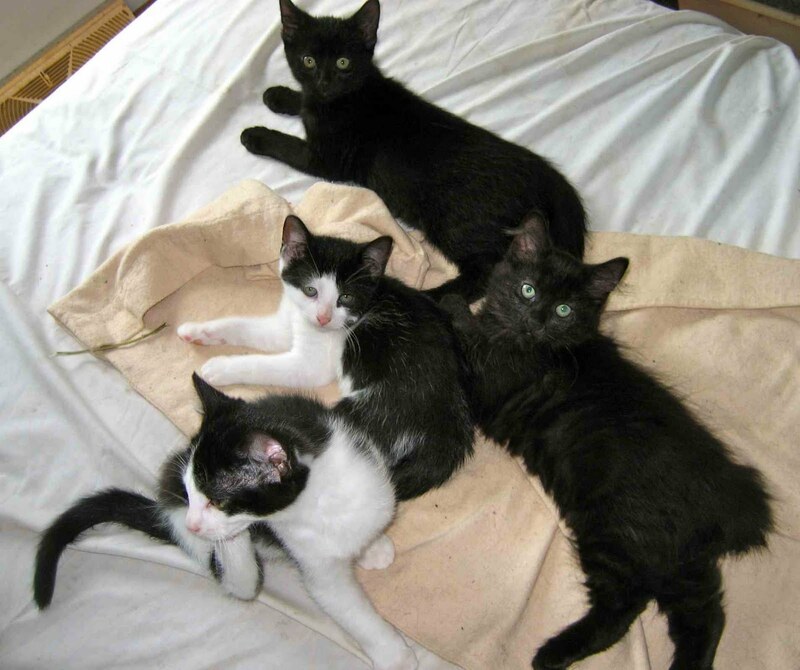 If you have a soft spot and a good home for a kitten, you might want one or both of these two kittens. One is all black and the other is black and white. Both are females. Contact Donna at dksarafin@yahoo.com or 273-0437. The Dunn’s Marsh Neighborhood e-News accepts some ads for its newsletter. They may be in the form of an attachment to the e-News. As in this case, a notice will inform readers about the advertisement. 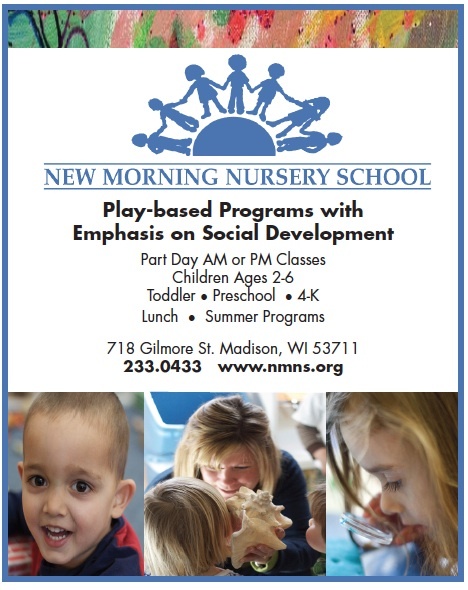 Attached to this month’s e-News is an advertisement for the New Morning Nursery School. 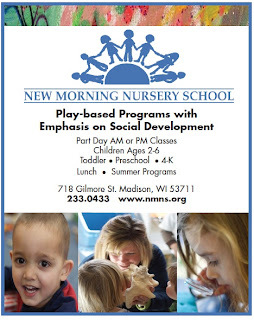 New Morning is a non-profit, parent cooperative nursery school located on Monroe St. in the Wingra School building and serving children ages 2-6. Brush Collection. Final rounds are currently in place. Crews will be on brush from now until snow, as available. But most of the attention will be on leaves once they start falling. For more information, check out the city streets website at: http://www.cityofmadison.com/streets/ <http://www.cityofmadison.com/streets/> . Triple A. Our new farm team? A recruitment poster for road side assistance? Nope. Our bond rating. This is a very strong signal that our city’s financial situation remains stable and strong, despite the economic difficulties we face. I serve on the Board of Estimates and we approved some additional borrowing in a special meeting tonight. We got an incredible interest rate thanks to the Triple A rating. It’s nice to share some good news. Read more at: http://www.cityofmadison.com/news/view.cfm?news_id=2853 <http://www.cityofmadison.com/news/view.cfm?news_id=2853> . Yeah! It’s a short one this time! Neighbors have been seeing bike detour signs on the frontage road and motor traffic detour signs for Hy 18/151 if they were in the vicinity of PD at Verona Road or Seminole Hy. What are they all about? Fortunately, a Fitchburg Alder sent me a notice which explains what’s going on. The westbound Beltline near the Seminole Highway bridge will be closed 11 p.m. Sunday (Oct. 16) to 5 a.m. Monday (Oct. 17) and 11 p.m. Monday (Oct. 17) to 5 a.m. Tuesday (Oct. 18) for bridge repair work. Westbound traffic will be detoured using Todd Drive, Frontage Road, Seminole Highway, McKee Road, and Verona Road. The Seminole Highway bridge will be closed concurrently with the westbound Beltline Sunday and Monday night. Motorists must use alternate local routes. Crews will be working to replace a girder on the Seminole Highway bridge. Although I haven’t checked, I believe this is part of the beginnings of the Verona Road project. However, according to a Strand and Associates spokesman I talked to this week, Verona Road project construction doesn’t start until 2013. We've had a couple great updates to the Green and Blue Events happening in and around Fitchburg this October (as highlighted below). Please feel free to pass these along to anyone you think may be interested. Rick Eilertson, Fitchburg Environmental Engineer. Thurs., Oct. 20, 5:45pm - 7pm - 9 Springs Recharge Project Final Presentation at the Mechanical Engineering Bldg (UW-Madison campus), 1513 University Avenue, Madison - http://www.city.fitchburg.wi.us/documents/9springsRechargePIM4.pdf <http://www.city.fitchburg.wi.us/documents/9springsRechargePIM4.pdf> This is the 4th public information meeting for the students to present their final report on the feasibility of using treated wastewater for water reuse projects in Fitchburg. Please visit https://sites.google.com/site/9springsrecharge/ or contact wrm2011@gmail.com for more information about the Practicum or the presentation. I’d like to encourage everyone to attend the Dunn’s Marsh Neighborhood Association Annual Meeting, Wednesday, October 26, 6:30 P.M., at Prairie Unitarian Universalist Society, Whenona Drive at Crawford Drive. The annual meeting is a chance for you to meet your neighbors, voice your questions and concerns, and learn about the neighborhood association. If any of this sounds of interest to you or you have ideas to suggest for the neighborhood or other issues to bring up, we hope to see you there. The state representative in the Wisconsin Assembly for our area is Terese Berceau. She sends out newsletters quite frequently to constituents. If you aren’t on her e-mail list, you can read her newsletter right here. The September and October issues are attached. Unfortunately, the CLICK HERE links don’t work in the attachments. You’ll have to get on her e-mail list to be able to access them. You may also order a free 2011-2012 Blue Book from her by contacting her at her e-mail address. The Blue Book is a great resource for information on Wisconsin and Wisconsin government.